Vanderbilt University Medical Center (VUMC) is among the top hospitals in the United States performing liver transplants, according to a recent report published in the American Journal of Transplantation. Vanderbilt performed 149 adult liver transplants between July 2015 and June 2016 (FY16). The volume ranks the center at No. 4 in the nation, according to the study, which is based on data released by the Scientific Registry of Transplant Recipients (SRTR). FY16 also saw a record-breaking number of liver transplants performed in the United States, with 7,127, states the report. “It is important to specifically recognize the investment of the Medical Center in supporting the establishment of our pediatric liver transplant program to treat the children of Tennessee, many of whom would otherwise not have access to these services,” he said. Liver transplant volumes at Vanderbilt have consistently increased over the past few years, said Sunil Geevarghese, M.D., MSCI, adult surgical director of the liver transplant program at Vanderbilt. “It’s really a tribute to our entire team spanning the VUMC clinical enterprise,” he said. 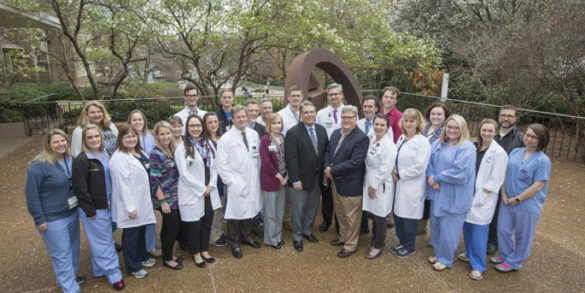 Roman Perri, M.D., medical director of the liver transplant program at Vanderbilt, agreed that the team’s tireless efforts positively impacted patient outcomes. “Being recognized as the fourth-largest liver transplant program in the country is really a testament to the hard work of our OR staff, nurses, social workers, nurse practitioners, hepatologists and liver transplant surgeons,” Perri said. In recent years, the introduction of new antiviral drug treatments for hepatitis C virus (HCV) has been a game changer for liver disease management and transplantation, said Geevarghese. Although the increase in liver transplants is celebrated, Geevarghese says the need for livers is still at a critical point. At Vanderbilt there are 190 adults waiting for livers and a second chance at life, while the pediatric population has two patients listed for liver transplants. The relatively new pediatric program at Vanderbilt saw three liver transplants during FY 16. Geevarghese said the program wants to maintain its transplant volumes while improving its strong transplant outcomes. The liver transplant program joins an already robust heart transplant program, noted as the second-busiest in the country, according to data released by the Organ Procurement and Transplant Network (OPTN). Ranked No. 1 in the Southeast region for volume for its combined adult and pediatric procedures, this marks the second consecutive year that VUMC’s heart transplant program held its national ranking. Geevarghese also gave credit to the liver transplant program founders — J. Kelly Wright Jr., M.D., C. Wright Pinson, MBA, M.D., VUMC’s Deputy CEO and Chief Health System Officer, and Jerita Payne, ACNP, MMHC, director of Clinical Transplant Services.